the use of the bow and arrow. cultivation of maize and other crops. In the course of its development, the Woodland complex spread westward to many areas of the Plains resulting in the adoption of a seemingly contradictory term "Plains Woodland". 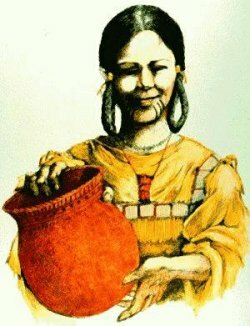 In Manitoba the major elements of this tradition, especially pottery and burial mounds, were introduced throughout the forest and prairie regions just before the first millennium A.D. Maize was also grown on a limited scale, although hunting of bison remained dominant on the prairies, and mixed economies based on hunting, fishing, and wild rice gathering characterized the Boreal Forest subsistence regime. 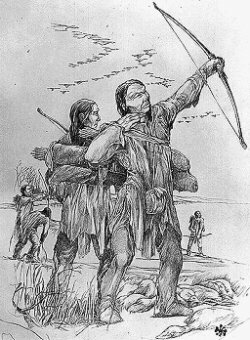 The expansion of these foraging economies were further enhanced by the introduction of the bow-and-arrow. Although large agricultural settlements did not develop in the Province, Manitoba First Nations maintained important trading relationships and cultural exchanges with Plains Village and Mississippian groups to the south and east. 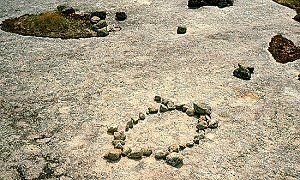 A particularly interesting and crucial feature of the Woodland Period is the appearance of significant aesthetic and ceremonial artifacts evident in Native rock art. 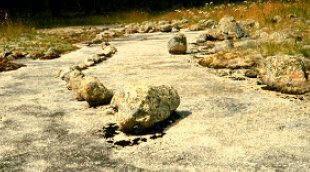 In Manitoba, this activity involved the elaborate arrangement of rocks into animal shapes and geometric patterns, technically termed petroforms, and the appearance of paintings, pictographs, and engravings, petroglyphs, on rock surfaces.